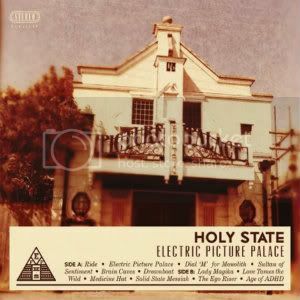 Having announced their split and cutting back the tour to promote ‘Electric Picture Palace’, it was never known what to expect from Holy State‘s debut full-length album, despite them having an impressive 2009 EP under their belts. However, the band have emerged from the depths of the Leeds music scene with an unapologetic, urgent punk sound which catches the listener’s attention whilst remaining easy to listen to. The shouty, concise tracks contain spadefuls of punchy guitar chords and vocals tinged with aggression, giving ‘Electric Picture Palace’ barrels full of punk ethos. ‘Ride’ and title-track ‘Electric Picture Palace’ set the tone for the rest of the album, driven forward by frantic drumming and punchy yet often monotonous and unoriginal guitar work. The single from the album, ‘Dial M For Monolith’ is as unoriginal as the two preceding it (if not more) and so far, ‘Electric Picture Palace’ has not impressed in the slightest. Hopes peak slightly when ‘Brain Curves’ kicks in as it initially suggests variation for the first time in the album, but it turns out to be another onslaught on the senses. However, the instrumental sections pick up and this is an area which Holy State excel in. The guitar and brass sections at the end of the track are a nice dose of diversity in an otherwise uninspiring album. Just as hope is almost entirely lost with Holy State‘s debut full-length offering, ‘Lady Magika’ and ‘Love Tames The Wild’ are presented to us. Two tracks which showcase Holy State‘s true capability to write tracks that don’t actually sound identical to one another. The noise is turned down, the melodic vocals and Arctic Monkeys style writing come into play, and ensure that these two tracks stick in the mind long after the album is finished. Unfortunately, for the remainder of the record, Holy State return to what they seem to feel most comfortable doing: loud attempts at punk music that fall somewhat short. The similarity of all of the tracks forces ‘Electric Picture Palace’ into love/hate territory and unfortunately, it’s far too easy to opt for the latter. The album is, however, laden with catchy hooks that only really begin to make an impression upon multiple listens. The question really is; will anyone actually want to listen to this album more than once unless forced to do so under torture? At least one good thing has come from listening to this album; we know that Holy State have broken up and therefore there’s no chance of our ears being raped in this fashion ever again.